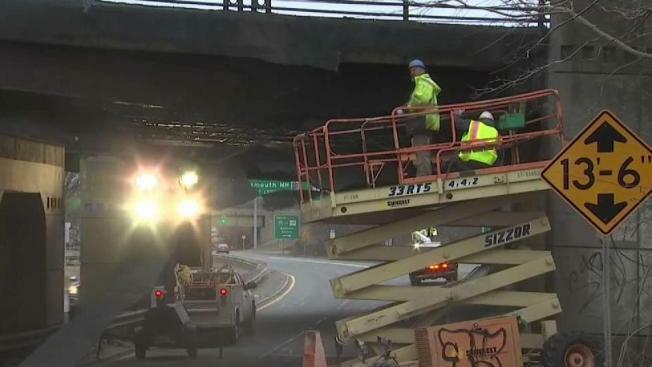 A truck damaged an overpass in Danvers and the damage could take several days to repair. The beam of a bridge in Danvers, Massachusetts, was damaged after being hit by a truck Thursday. Jacquelyn Goddard, communications director for the Massachusetts Department of Transportation, confirmed the vehicle hit the Route 1 overpass above Route 114. The damage prompted the closures of Route 114 eastbound at Route 1 and the southbound ramp from Route 1 to Route 114. The right lane of Route 1 southbound was closed, as well. Goddard said MassDOT would need to remove the beam that was hit, as well as part of the bridge deck and the sidewalk. She said the process could take several days.